Hair must be free of hair spray, oil, and gels. Remove any and all hair extensions, glue and clips. Undo braided hair, remove wigs and hair pieces. Please wash your hair within 24 hours of the appointment. Wear a button-up, zippered shirt, or a wide neck shirt so you are able to change your shirt without disturbing the EEG recording. Do not get the equipment wet while wearing it (no showers or baths during the study). Do not scratch your head. Do not run, jump, wrestle or participate in any extreme physical activity. Do not participate in any activity that will cause excessive sweating. Do not chew gum (constant chewing doesn’t allow for proper recording). Do not place electrical devices (headphones, electric blanket, etc.) on the electrodes. Patient may use a telephone, but keep the phone on the ear, do not lean the phone on the side of your head. A set-up technician will call thirty minutes prior to your scheduled appointment. The technician measures your head and marks your scalp with a crayon to map out where 25 flat metal electrodes on your scalp will be temporarily secured using collodian, a gentle adhesive glue made for skin. Connecting the electrodes to your scalp is painless. You will not lose any hair from the attachment of the electrodes. The EEG electrodes attach to leads (wires) that connect to a recorder called the Track-IT device, which collects the electrical activity in your brain. You will be wearing the Track-IT inside of a small bag over your shoulder or cross-body over your chest. The video camera will be mounted on a lightweight tripod with an acquisition laptop and microphone attached. The technician will set up equipment in the room you will be in most often and run a 10 minute baseline study. Your study set-up appointment takes approximately 2-3 hours in order to complete all lead placement, review of testing instructions and equipment. 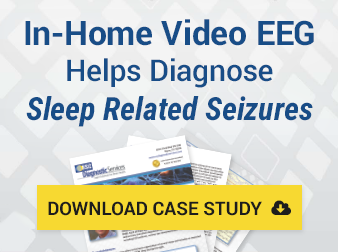 Throughout the duration of your in-home EEG, a monitoring technician will remotely log into the study three times a day (at a minimum) to ensure that all electrodes are working and recording properly. You will be asked to keep a diary of your activities such as sleeping, eating, and any seizures/events that occur (A family member may record these events if necessary). Avoid scratching. If you have an itch, gently tap or pat the itchy electrode. Scratching will loosen the connection and affect the quality of the test. If an electrode becomes disconnected, your set-up technician will be dispatched to your home to resolve the issue. You will be asked to periodically check on the laptop screen. You should see a clear picture centered in the pop-up screen. You should also notice that the frame numbers are increasing/advancing. If you do not see these numbers increasing, please contact your local technician immediately. If at any time you notice a black screen, a white screen, one STOP sign (versus two STOP signs) or a PLAY button, please contact your technician immediately. LOG THE EVENT ON YOUR DIARY USING THE TIME LOCATED ON THE HEADBOX/TRACK-IT DEVICE. DO NOT USE THE LOCAL TIME ON YOUR WATCH, PHONE OR WALL CLOCK. You or a family member can do this. Talk out loud or into the microphone describing any symptoms or events you are experiencing. You or a family member can do this. At the end of the EEG study, a technician will return to your home to gently remove the electrodes and collect the recording equipment. After your study is completed, your doctor will then review and discuss it with you at your next visit. Do not ask your technician about results, as they are unable to interpret or explain results. Only your physician can discuss your study with you.